Temperature/ relative humidity probe DigiS/M. Temperature/relative humidity probe DigiL/M on the cable. Measured values are shown on the graphical screen with backlight option and the ability to change the size of displayed digits. Optional cable length 1, 2, 5, 10, 15 metres. The device can be set from the keypad. You can set a password to prevent unauthorized access to the device settings. To communicate with a PC and other systems, the device is equipped with a USB port (located on the side of the device), RS232 and Ethernet. universal protocols SNMPv1 and XML - send data to COMET DATABASE software which contains many useful tools for data analysis - graphs, tables, statistics, etc. Internal atmospheric pressure and / or CO2 concentration sensors. Battery and mains power supply. Measured values are stored internally in non-volatile memory. Alarm indication by LEDs or graphical display. All models have 4 input connectors for external probes or signals. These may be supplemented by an internal atmospheric pressure transducer and / or CO 2 sensor. It is possible to set two independent alarm limits for each channel (ie. measured or calculated value) which can be configured either as an upper and lower limit or two limits exceeding in a consistent direction. Alarm signalization can be acoustic (built-in beeper), optical (3 LEDs), alarm output or sending an e-mail alert. Power is provided from an external AC adapter, and operation of the device (except Ethernet interface) is backed up by replaceable batteries. The device can be used permanently installed or as portable device with the option to charge batteries directly using the AC adapter or using standard alkaline batteries size AA. Battery life is several months. Temperature and humidity probe on a cable. USB port for easy connection to a PC (D series only). The measured values are stored in the internal nonvolatile memory for 16 000 records. The device can be set from the keypad. Measured values are displayed on a backlit display. Inputs for up to two temperature probe Ni1000. 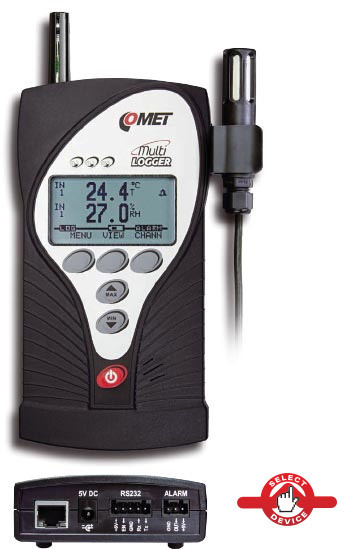 Commeter with record - D0211 and D0221 can also measure together with Pt1000 probes. 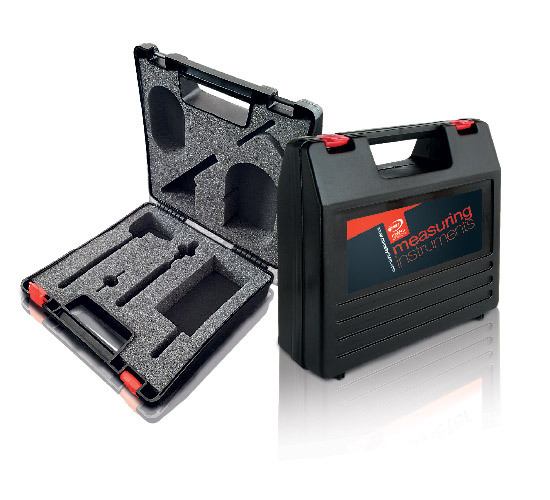 Commeter series D comes in a case for safe storage and transportation. There is also a place for accessories. 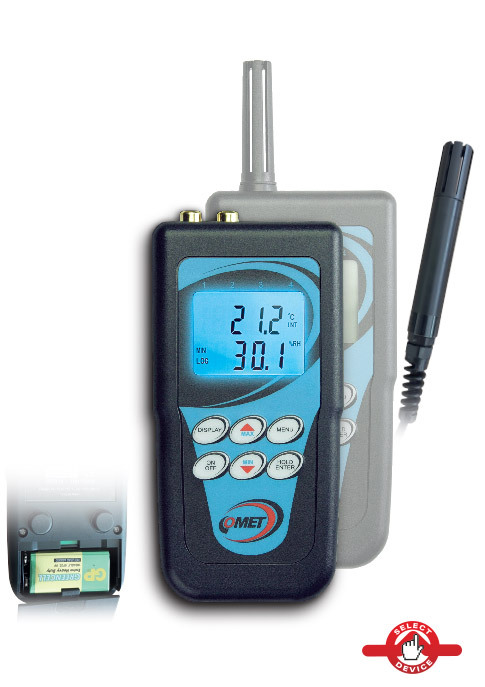 COMMETER portable devices measure physical quantities such as temperature, dew point, humidity, atmospheric pressure or pressure tendency over the past three hours. The measured value is displayed on dual line LCD display. MIN / MAX value or a manually stored measured value can be read on the display. For each measurement channel can be set upper and lower limits. In case the limits are exceeded these limits alarm is indicated as the value blinking on the display. If the alarm is activated, the device can draw attention to this fact also by intermittent acoustic signal which can be turned off. Measured values can be stored in memory. Measured values are stored either automatically or manually. Automatic record stores the values at pre-intervals from 10s to 24h. Logging mode can be adjusted as non-cyclic, when logging stops after filling the memory or cyclic, when the oldest recorded values are overwritten by new ones after the memory is full. You can store up to 16 000 values. Manual mode allows you to save the current values by pressing HOLD / ENTER. Stored values can be transferred via the USB port to PC. The recorded data can be transferred to a PC for further analysis. Obtained values can be displayed in the form of a table or graph, data can be printed or exported to dbf or txt format for further processing of spreadsheet software. Measuring and recording system MS has been developed to meet all requirements for the possibility of alarming. Each of the 16 channels offers setting of hysteresis, a delay and up to four conditions to active alarm. Alarm can be presented as sound (buzzer) and as visual signal (LED 1-32). For each alarm you can assign actions to be performed. COMET AFRICA specialises in the supply, design and implementation of cold chain management solutions. 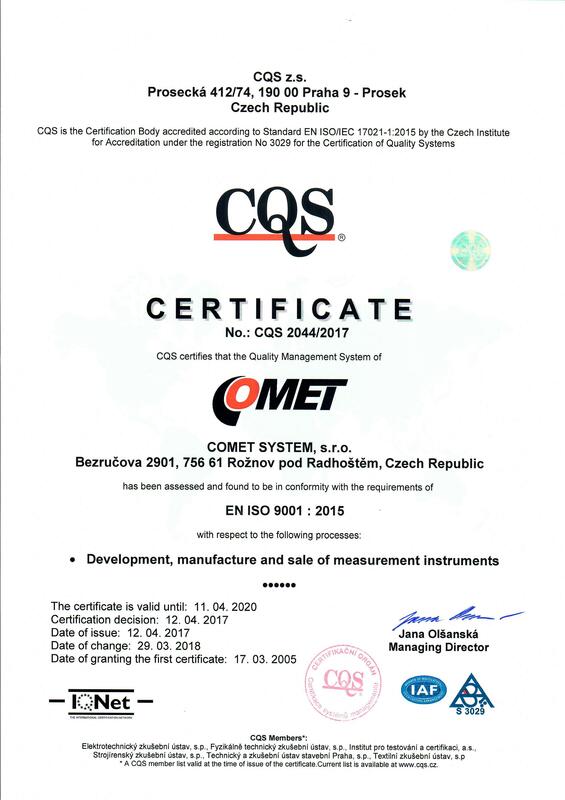 With many years’ experience in cold chain management, COMET AFRICA has grown by adding new products to its market offering, namely: SMS notification, GPRS Remote Data Access, Online Data Hosting, IOT sensors and Custom Software for turnkey solutions. We have a number of distribution points throughout Africa, including Kenya, Uganda, Ghana, Zambia, Botswana and Lesotho. We offer a wide range of products from Hand Held devices and Loggers, to fully integrated Temperature, Humidity, CO2 and Pressure monitoring, recording, alarming and notifying systems. The business philosophy of COMET AFRICA is to continually expand by upgrading products and services to keep up with changing technology. 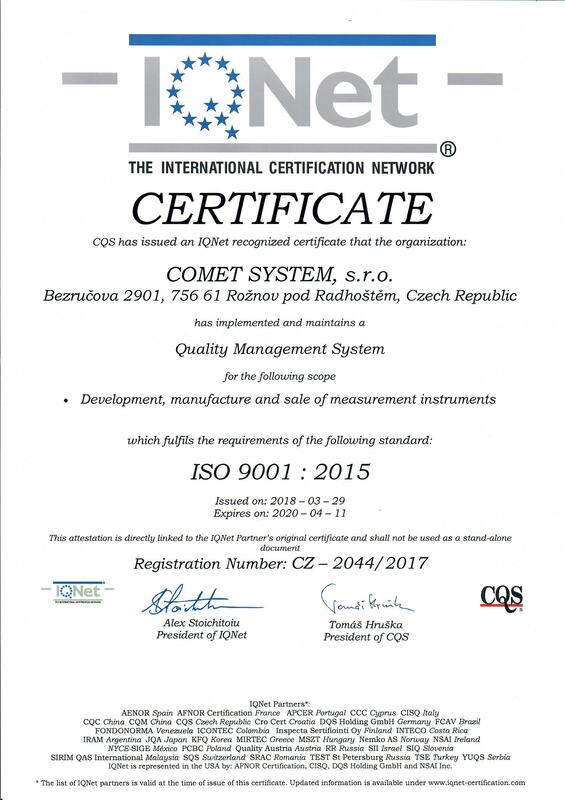 The Success of COMET AFRICA to date has resulted from the delivery of high end products and solutions to the industrial sector with continued attention to customer service.